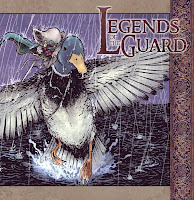 Mouse Guard will have an anthology spin-off mini-series starting next year called Legends of the Guard. The handpicked creators will be getting to tell their own stories in the Mouse Guard world. The list of creators on-board so far is very hush-hush, but a few names that I can mention are Jeremy Bastian, Nate Pride, and Mark Smylie. You can read a little more about it on CBR. When I was in high school and my friends and I wanted to design characters (or perhaps even redesign our characters costume) we would use a sheet of photocopied 'blank' superheroes. This way we could just draw costume ideas or try colors without having to redraw the human form over and over and over. When it came time to design Mouse Guard clothing, I used the same technique. 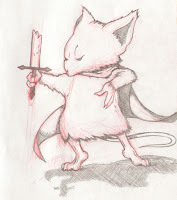 I drew two 'blank' mice and copied them so I had a full sheet worth. And just like with my high school heroes, I can sketch out ideas, even crazy ones, without having to redraw the model. I find this very freeing to my designs. Not only do I save time, but I'm more likely to try unlikely ideas because of the lack of risk in screwing up the drawing underneath. 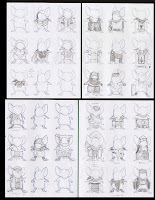 Here you can see some of the designs that ended up going into the Winter extras and epilogue. As a long-time turtles fan, I was really happy to pick up and read the collected volume that was just released this summer. And I found out that someone I owed a favor to, was also a TMNT fan, specifically of Raph. So I took the opportunity to do a drawing for him. After I colored it and mailed him the original inks and a color print, I thought it would be fun to play with photoshop to replicate the look of the old B&W style tones that were used in the original series. Here are the results. As long as we are on the subject of gifts and fan art. I wanted to share this piece I did as a gift for Mike Mignola. I love Hellboy and was really taken with the twist the latest 'Wild Hunt' storyline has taken. After reading Issue #6 I was forcing Julia to read the issue and study the panels and impact of what Mike and Duncan had done. I was planning on doing a drawing for Mike that I owed him for a favor, but the recent issues cinched what the subject would be. Julia and I want to express thanks to Mike and Christine and Katie for their kindness. Christopher Rice dropped this off at the Archaia booth at the Long Beach show while I was away from the table. It's funny because I saw him working on it in the Archaia panel at that show. Sorry I missed meeting you Christopher, and than you for the artwork! I can't wait to see Jeremy Bastian's artwork on Mouse Guard!!! When I went to Detroit comic con earlier this year and you told me about Curse Pirate Girl it sounded a bit weird but after reading the book I'm hooked and I can't wait til we get a look at something different from your style!!! Btw will the Hellboy creator jump on this project??? I was recently reading Fall 1152 when i came across a page that i thought was weird. It was a scene which had Lieam is talking to a mouse who is a map reader, but when they are talking you see a map or papers with the words " Black Axe" on it. I was wondering if there is anything to it??? I'm really excited about the Legends of the Guard idea! It's always heartbreaking when I finish an issue of Mouse Guard and realize that I have to wait at least 2 months for the next issue. This will at least minimize the pangs of withdrawal. I really hope Katie Cook gets involved in this project. Her work has an amazing simplicity and cuteness that I think would lend itself well to a MG story. With you guys being buddies and all it seems like a good choice if she has time to fit it in with all of her other projects. Luis: As I said, I love Jeremy's work both as an artist and a writer/creator. I trust him fully in the world of Mouse Guard and I am VERY excited to see what he comes up with. Osmany: It was mainly there to enforce the idea that Clarke's Cartography was involved in the plot to use the axe to overthrow Lockhaven and make Midnight ruler of the territories. Levithepirate: I'm hoping the Legends series will offer a nice buffer for fans while they wait for me to crank out another issue of my 1 man show. Legends of the Guard... yes, yes! YES! This is going to be awesome! I am so happy! More Mouse Guard stories, and undoubtedly to be told and illustrated by some very talented people. This will be a very welcome addition to the world of Mouse Guard, especially since you are handpicking the storytellers. I have to say that this Hellboy image MIGHT be my favorite piece of art that you've EVER drawn, David. It is simply stunning. You've really pulled out all the stops and drawn on (no pun intended) everything that you do best for this piece - detail, composition, color, juxtaposition, lighting, illustrating a theme and really telling a story through just a single image - not just using all of those "tools" for lack of a better word, but using them together and in combination to create an image that has such a powerful impact... when you put all the parts together, the sum of the parts becomes something more. I really hope that one day you get a chance to do a Turtles story and a Hellboy story. Something of a moderate length, maybe like an annual length story of 48 to 64 pages. Brandon: Thanks for the comments! I am very excited about the 'Legends' series, and even more-so by the enthusiasm of the creators who are participating. I am pleased with the Hellboy piece as well. Part of the goal was to merge the notions of Hellboy wearing a crown no matter which side of his family tree he sided with. So the flag in the window above him has a red dragon (arthur's symbol) with the crown breathing fire was my attempt at that. And I'd love to do a Turtles or Hellboy story at some point...but I already have too much on my plate at the moment.